As every year, the German soccer cup final will be held in Berlin. This year it’s on May 27. The teams of Borussia Dortmund and Eintracht Frankfurt will endeavor to bring the season to a triumphant end by winning the much coveted cup. 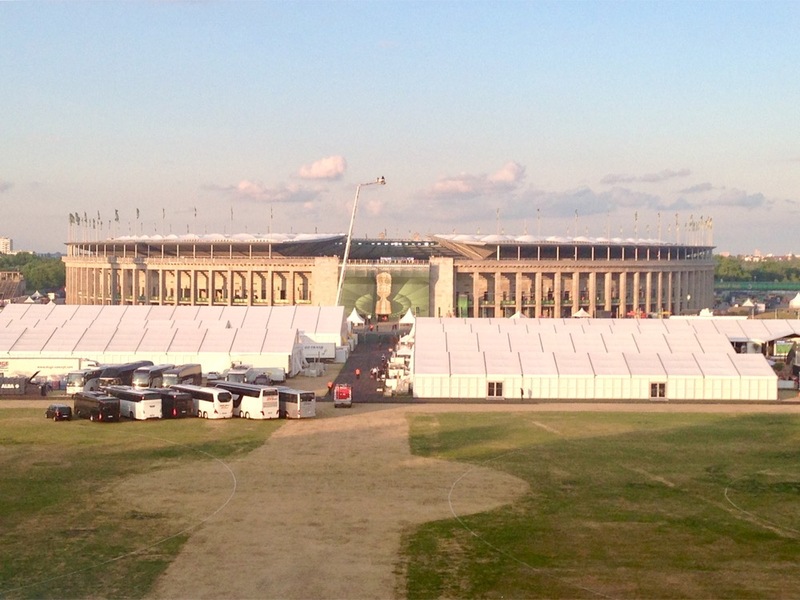 The cup final has been staged in the Olympic Stadium in Berlin since 1985. Last year I happened to work for the team of a television network that broadcast the game. That allowed me a glimpse behind the scenes, otherwise hard to access. 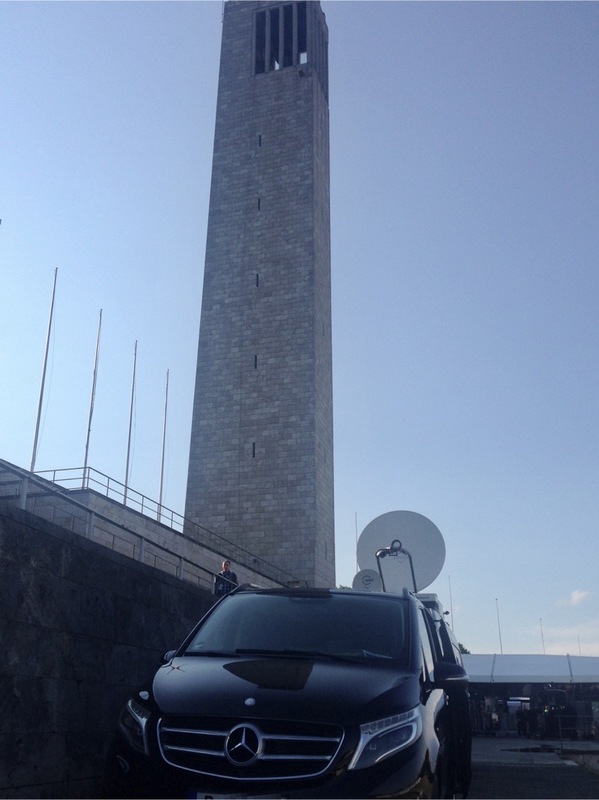 I had the privilege of parking my vehicle right at the stand of the Maifeld (a large expanse just West and adjoining the Olympic Stadium), right under the Bell Tower. Even today the site gives you goose bumps as you take in the megalomaniac dimensions of the Nazi architecture. Built to hold the eleventh Olympic Games of the Modern Age, the Olympic Grounds in Berlin is one of few remaining examples of Nazi era architecture still intact. The fact that the 1936 Games were to be held in the capital of the then German Empire could arouse very little enthusiasm with Adolf Hitler. International understanding and the youth of the world coming together in a peaceful way was not something that figured high on his agenda. However Goebbels, Minister of Propaganda, could convince Hitler that the Games could prove to be invaluable in the effort of polishing the tarnished image the Nazi regime had meanwhile acquired abroad. So the event, held from August 1 to 16, can with some justification be addressed as Hitler’s Games. The surviving buildings, the Olympic Stadium and the Maifeld with the adjoining Langemarkhalle and the Bell Tower, bear architectural witness to the megalomania of the Nazi regime. My special position at the foot of the bell tower not only gave me a first-hand look at the machinery of a German soccer final game but also new ideas about the original aspirations of the Nazi architecture. So, on Saturday May 27 some 70,000 spectators will again flock to the stadium. Hopefully some will come a little earlier in order to see the exhibition in the Langemarckhalle, which is truly worth a visit. It focuses on the history of sports and also on the subjugation of sports for militaristic purposes by the totalitarian Nazi regime. After the exhibition, time to enjoy the fantastic view from the Bell Tower with its vantage point of 80 meters. Taking the transparent elevator from the exhibition to the top of the tower the entire Olympic Grounds spreads out before your eyes. Good visibility provided, you can play a game of „spot the sight“ for all of Berlin. Just off to the south of the Olympic Grounds there is a very special place. It looks like the ruins of an observatory with its towers and cloth-covered spherical structures. However, its object was not the discovery of far away galaxies but the more mundane goal of spying on the enemy during the Cold War. 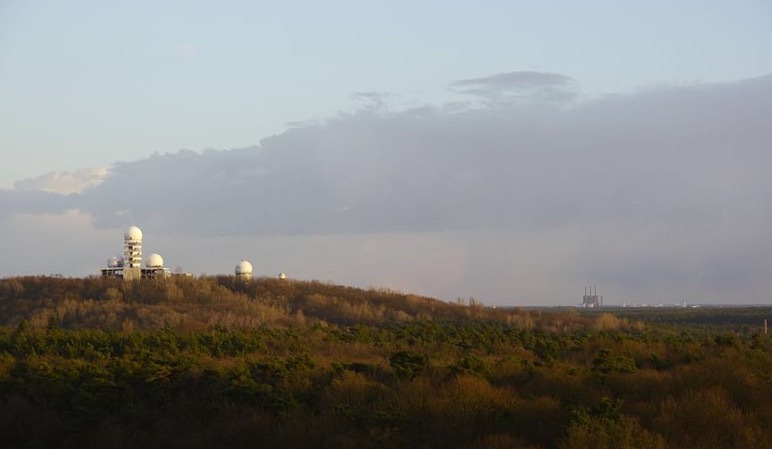 These are the remnants of the radar station on Teufelsberg, once one of the most important locations for the British and the Americans to intercept messages sent between the member states of the Warsaw. So here’s my advice: make a dash before the whistle, up the tower and enjoy the view of this fascinating city.